A student information system is a software application for institutes, colleges, schools to manage student data. Student Management System deals with all kind of student details, academic related reports, college details, course details, curriculum, batch details and other resource related details too. It tracks all the details of a student from the day one to the end of his course which can be used for all reporting purpose, tracking of attendance, progress in the course, completed semesters years, coming semester year curriculum details, exam details, project or any other assignment details, final exam result; and all these will be available for future references too. i want to create a project so i need a sample project. I also want to evaluate. i want to create a database system for a college give me a sample on jobisaac_okello@yahoo.com. Sorry I cant send projects by mail..
student management system er diagram and system design is uploaded in this site.. please check it.. Please give me link of Jwellery shop management system using C#……. Right now we have not developed school management system project in c#. If you have requirements please send it to freestudentprojects.com@gmail.com . hope we send you complete code of this. 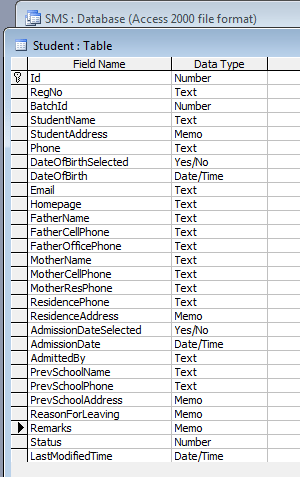 please help me, send me the code of student management system in vb.net..
i need to see the codes of the project …. please very very argently….. i request you..
may project is primary school manegament system window base. vb.net 2008. microsoft access 2003. Yes. definitely we send project code to you. please i am in great trouble …… please send me the idea to create or possibilites … that how to create or generate .exe fle in my emailid -ybhupendra123@ymail.com………………..
sir plz send me the c#.net source code for gas agency management system..
please help me for my project Student information system in C++ Send me a code please po Joseph_miranda03@yahoo.com help guys kung cnu nmn nkakalam !! dear expert can you please send me “the conference hall event reservation system project @ jamesyai2015@gmail.com. thanks indeed.